BlackBerry 10 gets slightly more affordable, but does that make any better? The BlackBerry Q5 is difficult to love. Sure it's got all the core smartphone features, but it doesn't really excel at anything, apart from perhaps web browsing, but even that's hampered somewhat by the pokey 3.1-inch display. 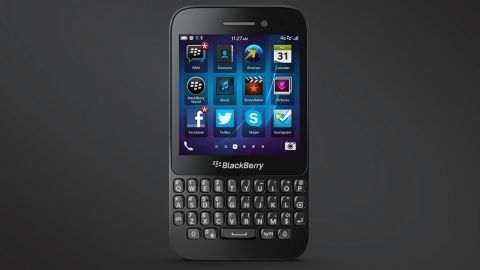 It's a Q10 for people who can't afford one. BlackBerry 10 gets ever so slightly more affordable with the introduction of the BlackBerry Q5 to the Canadian firm's smartphone lineup. But don't go thinking this is a bargain basement offering, because it carries a mid to high tier price tag. Unveiled at BlackBerry's annual Live conference in Orlando in May 2013, the BlackBerry Q5 was hotly rumoured under the moniker BlackBerry R10, and while the name was a bit of a surprise at launch, pretty much every other detail had been leaked correctly. It slides in below the fully touchscreen BlackBerry Z10 and its keyboard brethren the BlackBerry Q10, perhaps in a vague attempt to catch the eye of the Curve generation. What you get on the BlackBerry Q5 is the same, oddly proportioned 3.1-inch, 720p IPS LCD display you find on the BlackBerry Q10, 1.2GHz dual-core processor, 2GB of RAM, microSD slot, 5MP rear camera, 2MP front camera, Wi-Fi, Bluetooth, NFC, 4G and a 2180mAh battery. Of course below that rather square screen you'll also find a 35-key physical QWERTY keyboard, which sports isolated keys instead of the side by side layout on the BlackBerry Q10. In terms of price the BlackBerry Q5 is going to cost around £330 (around US$500 / AU$550) SIM-free, which puts it up against the likes of the Sony Xperia SP, Motorola Razr HD, Huawei Ascend P6 and Nokia Lumia 720. Look the BlackBerry Q5 up and down and it's immediately obvious that this isn't a premium device, with a sizeable bezel above and below the screen, and then a chunk of plastic below the keyboard too. The additional space below the display is actually not a bad thing though, as the upwards swipe required to close applications is made easier with this gap - something that was sorely missing from the Q10. Pick the Q5 up and its plastic body is very noticeable. It does feel solid, but at the same time the matt gloss plastic rear and chunky dimensions of 120 x 66 x 10.8mm (4.7 x 2.6 x 0.4 inches) do take you back a few years to BlackBerry phones of old. At 120g (4.2oz) the Q5 is suitably weighted, thankfully, because if it was nearer the 100g (3.5oz) mark you might mistake this for a toy - which isn't totally out of the question anyway. BlackBerry has said that the Q5 is targeted at the younger generation who generally share content, like to be connected with mates and want their own freedom - although it's not exactly the handset you can see kids showing off to their friends. The back looks like it should come off, but it doesn't - honest. We were fooled when we saw the Q5 at BlackBerry Live in May, but after a few minutes of trying to yank it apart we were politely told it wasn't possible, so don't bother. There's no access to that battery then, and when it comes to the micro SIM and microSD slots, you'll find a flap on the left of the handset covering both ports. We have a couple of bug bears with this set up. Firstly the flap itself, while easy to remove and replace, doesn't exactly fill us with confidence that it will actually protect our cards, or at least keep out some dust. Push the flap in and it makes a satisfying clicking sound, suggesting you've snapped it snugly into place, but apply the lightest amount of pull to the top and it comes away easily from the BlackBerry Q5, and we can see this filling up with dust and dirt quickly. Secondly, there's not a great deal of instruction about which way around you should insert the cards, and you'll need at least some finger nails to pop them into place. Up top you get a headphone jack and the now common-place centralised power/lock key, but unlike the metallic finish found on the BlackBerry Z10 and BlackBerry Q10, the BlackBerry Q5 has been lumbered with a plastic button. There's more plastic on the right, with the trio of buttons comprising a voice command key sandwiched in between volume rockers. All are easy to hit with one-handed operation, but it's disappointing that BlackBerry couldn't treat us to at least a little bit of metal. On the base is a central speaker grille, but no micro USB slot, which is found on the left at the top of the handset - one of our least favourite positions, since it makes it difficult to handle the Q5 when plugged in. Sure the BlackBerry Q5 comes in some slightly more entertaining colours other than black - you can also pick from white, red and pink - but at the end of the day it's not particularly desirable in terms of looks. Perhaps we could have overlooked the various design niggles on the BlackBerry Q5 if it sported a more reasonable price tag, but seeing as it doesn't and looking at its competition it's hard not to feel a little cheated here.